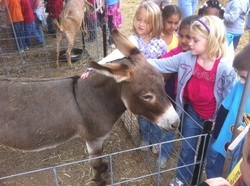 Crawford Farms Petting Zoo allows patrons of all ages to enjoy the pleasures of admiring, studying and touching gentle farm animals. With easy accessibility to pens, you are sure to enjoy many of the animals that provide us with valuable farm products and often companionship. Returning this year is an even more interactive way to enjoy the livestock experience. 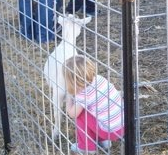 With parent or other accompanying adult supervision, children have the ability to get in the same pen with gentle goats. For a modest $1 fee, specially formulated cups of pellets can be purchased to hand feed the animals. PLEASE DO NOT FEED ANIMALS CORN FROM THE FIELD. IT IS NOT MATURE, DOES NOT MEET ALL THEIR NUTRITIONAL NEEDS AND CAN MAKE THEM SICK. ​In order to provide for the welfare of the animals, they are routinely moved into larger pens to allow for greater exercise and in order to experience a greater quality of life. This may prevent all animals from being on exhibit at all times.